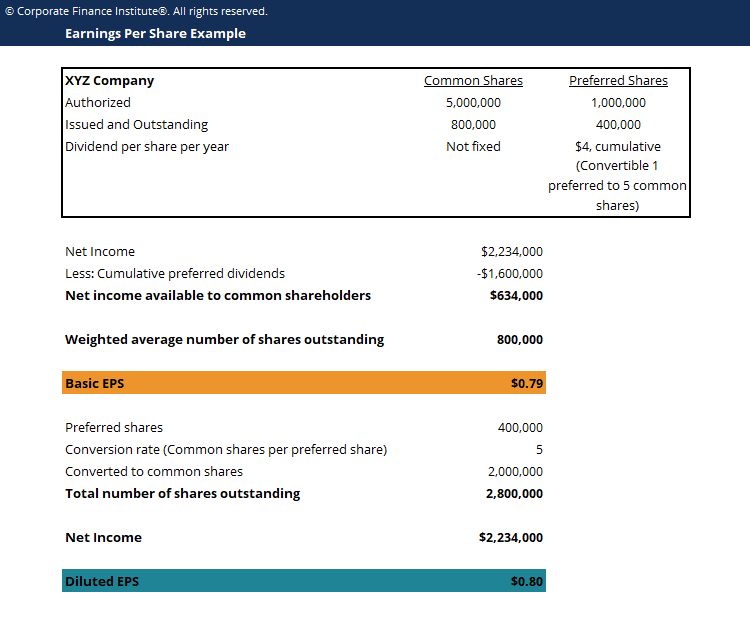 This earnings per share template helps you calculate basic and diluted EPS given information on common and preferred shares. Earnings per share (EPS) is a financial ratio, which divides net earningsNet IncomeNet Income is a key line item, not only in the income statement, but in all three core financial statements. While it is arrived at through the income statement, the net profit is also used in both the balance sheet and the cash flow statement. available to common shareholders by the total outstanding sharesWeighted Average Shares OutstandingWeighted average shares outstanding refers to the number of shares of a company calculated after adjusting for changes in the share capital over a reporting period. The number of weighted average shares outstanding is used in calculating metrics such as Earnings per Share (EPS) on a company's financial statements over a certain period of time. The EPS formula indicates a company’s ability to produce net profits for common shareholders. A single EPS value for one company is somewhat arbitrary, but the number is more valuable when analyzed against other companies in the industry, and when compared to the company’s share price (the P/E RatioPrice Earnings RatioThe Price Earnings Ratio (P/E Ratio) is the relationship between a company’s stock price and earnings per share. It gives investors a better sense of the value of a company. The P/E shows the expectations of the market and is the price you must pay per unit of current (or future) earnings). Between two companies in the same industry with the same number of shares outstanding, higher EPS indicates better profitability. EPS is typically used in conjunction with a company’s share price to determine whether it is relatively “cheap” (low P/E ratio) or “expensive” (high P/E ratio). There are several ways to calculate earnings per share.